Introverts (or those of us with introverted tendencies) tend to recharge by spending time alone. They lose energy from being around people for long periods of time, particularly large crowds. And hence generally does not prefer a place where there will be a large crowd. Additionally, they are drawn to the inner world of thought and feeling. They spent good amount of their time in their homes, libraries, quiet parks or other secluded places reading books or watching series, etc. Note: There’s is nothing like an absolute Introvert. Everyone is a mix of introvert and extrovert characteristic. It is just that, introvertedness is more dominant in us. Focus: Introverts like to focus on one task at a time and can have mighty powers of concentration. They’re relatively immune to the lures of wealth and fame. Generosity: Introverts will allow their fellow colleagues or say extrovert partners to take the center stage and do not crave for spotlight. In all, they would be happy to give up their happiness for others! A freedom of when you come and go – basically an unforced workplace gets the work done for the introverts! Since we speak less, managers can give introverts a lot of work without showing/ giving much attention to us. How Introverts can succeed at work? Introverts have the ability to listen, to be organized and have laser sharped focus. Additionally, they are creative & deliberative in nature. Introverts can use these traits to deliver the work like no one! Work alone. You’re going to be best able to design revolutionary products and features if you’re working on your own. Not on a committee. Not on a team. How Introverts can balance their energy? Introverts need to have restorative niches where they can get back to their full introvert mode. @bonisatani.. I want knowing this “restorative” thing introverts have. This is informational. In an extroverted world where an introvert keeps hustling all day, he find such places to prevent the burnout. I am not sure if I answered you satisfactorily, hence let me know if you need more information. 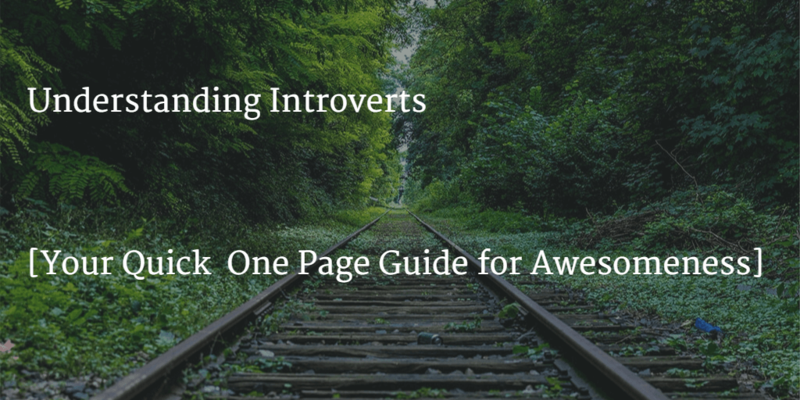 This is a great analysis of introverts in the business world. Really enjoyed reading it. Thanks Mark! Happy that it helped you! Nice post Boni, enjoyed reading.. Looking for more such interesting stuff ahead….!!! Fantastic! Happy to hear that you enjoyed it!